When I talk about transitions in Android I'm referring to the Animations that link Views or Activities together. So when a user navigates from one View or Activity to another, they may see the present widgets slide to the left and the new ones slide in from the right, or the old widgets might fade out while the new ones fade in. In a post I wrote a while back I outlined how to implement a slide in slide out animation with Views, using the android ViewFlipper component and a number of translate animations. At the time I mentioned that this transitions animation was for views only and that there was a global control in the settings menu for enabling transitions for activities. At the time there did not seem to be a way of control the transitions for activities on a per Activity basis. That was back in Android 1.5, but since then things have move on some. 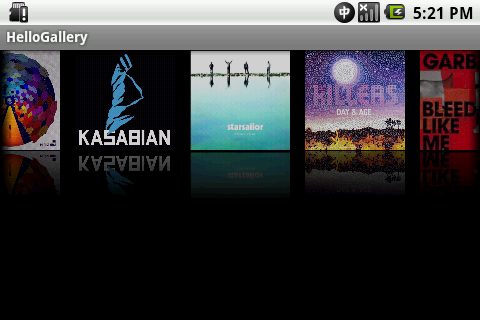 With Android 2.0 it is now possible to control the transition animations for activities. These transitions can be enabled or disable on a per activity basis and it is also possible to set the in and out animation for each activity. The first thing you need to know to override the activity transition is that there is a new function call in the Activity class called overridePendingTransistion. This function takes two arguments, the resource ID of the enter, or in, animation and the resource id of the exit, or out, animation. Also there is a new flag in the Intent class called FLAG_ACTIVITY_NO_ANIMATION, which gives control over which Activities transition Animations are shown. So by using the new flag and the new function call it is now possible to control the transitions of your Activities in the same way as your Views. I admit some of these statements don't give too much away, but there's not too much else to go on at the moment. It does seem to point to a language that is compiled and is C like, but maybe with not all the power of C as allocations are not allowed. Trying to shed some more light on things I had another look in the source code and found a few simple example Android applications usingrenderscript One of these simple example applications was called Fountain , it seemed to be one of the simplest applications so i thought it would be a good place to start. What does this application do? Well I'm not totally sure because i haven't run it myself, and to be honest there are not many comments in the code, so it really is a case of read the code and work it out. My best guess is that it produces a Fountain like animation that randomly animates points on a screen generally moving up and outwards in a fountain like way. These animations start when a users touches the screen and originate from that point. This is my best guess at the moment from what I can make out in the code example. Yes, it is very C like. We have structs, pointers and chars. Starting at the top of the file. We have a Control structure or class that gives use a rate and a count as well as x,y and r,g,b values. Where does this Control structure get instantiated? I'll come back to this. Another structure that is also used in this code is point_s. This structure has a x and y coordinates, r,g,b values, which are likely to be Red, blue green, and an "a" value which is the alpha value. Without more information I cannot be sure exactly what is happening in this code, but I think that generally an array of points is given and then array of new points is generated, to allow some kind of animation. // because we are about to compile the script. I'm not going to try and go through every detail of this code, but it seems that the interesting areas are in the initRS function. Here we have element builders, Simple Mesh builders and last but not least a script builder. Here we get a script builder instance, set the script to the fountain.c file. Set up some types such as Control and point (remember, these were used in the fountain.c file) and then create the script. So there we have it, this is a quick peek into how Renderscript might be used. There are still a lot of unanswered questions yet, and there is still a lot more to learn about how renderscript will, and can be use, but i hope these few code snippets will at least give people a starting point. As usual, if anyone else out there has any interesting insights or comments I'd be really interested to hear them. It seems that the new and exciting high performance graphics technology for Android is RenderScript. There's not much detail as how to use RenderScript, but it is said to be a C-like language for high performance graphics programming, which helps you easily write efficient visual effects and animations in your Android applications. Also RenderScript isn’t released yet, as it isn’t finished. After having a dig around in the source could I found the java Libs for RenderScript here. I'm sure there will be more information on this new and exciting addition to the Android graphics framework soon. When i find out more I'll post it here. Hopefully I'll also have a few tutorials on RenderScript soon. Android UI and Animations, what's new? For Android 1.6 here are some of the UI and Animation updates. AnticipateInterpolator: An interpolator where the change starts backward then flings forward. AnticipateOvershootInterpolator: An interpolator where the change starts backward then flings forward and overshoots the target value and finally goes back to the final value. BounceInterpolator: An interpolator where the change bounces at the end. OvershootInterpolator: An interpolator where the change flings forward and overshoots the last value then comes back. This gives the programmer a much more concise way of declaring and implementing click listeners. 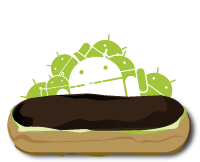 For more info' on the changes to the UI framework in Android 1.6 see the post here. New WallpaperManager API replaces and extends the wallpaper APIs that were previously in Context, to allow applications to request and set the system wallpaper. Here there a two new methods in Animation called setDetachWallpaper and getDetachWallpaper. By setting Detached wallpaper to true an animation will only be applied to the window, and the wallpaper behind it will remain static. KeyEvent has new key dispatching APIs, to help implement action-on-up and long press behavior, as well a new mechanism to cancel key presses (for virtual keys). One last interesting thing on UI and Animations for Android 2.0. I've heard rumours that there is a "new exciting graphics technology" that is being worked on. I couldn't see any real evidence of this on the current android 2.0 release, but I read on blogs that there is another minor update due before the end of the year. So who knows, maybe this new graphics technology will be part of that minor release. If I find anything I will of course write about it and let others know. On it's own the android emulator cannot simulate physically moving the device, but with additional software we can emulate movement and position of a physical Android device. The software that we'll need to do this is called Sensor simulator and can be downloaded from here. Once you have everything installed and running, you can manipulate the orientation of you virtual phone in the sensor simulator application just by rotating the wire frame representation of the mobile phone. The sensors that are currently supported are the accelerometer, compass and orientation sensors, additionally there is also support for a temperature sensor. To use the sensor simulator in you application takes a few simple changes to the code, which are outline here. Once this is done you can now test out your application that uses sensor data in you emulator, a much quicker process than loading it onto an actual android phone. There's more instructions on the Sensor simulator web site, but it's all straight forward and you should be able to virtually control the orientation of you emulator in no time. CameraPreview sample code available on the android developers website. My aim was to take this code and with as little changes as possible make it so it could be used to give a live camera preview in the emulator. //Set the IP address of your pc here!! Make sure that you change the ip address to that of your PC. // underlying surface is created and destroyed. 3. mCamera = Camera.open(); is replaced with mCamera = SocketCamera.open();. Note: if the WebcamBroadcaster is not picking up your devices you most probably have a classpath issue. Make sure that you classpath points to the jmf.jar that is in the same folder as the jmf.properties file. If JMstudio works ok, its very likely that you have a classpath issue. There's a lot of talk out there at the moment on this subject, so I couldn't resist writing a few lines on it myself. Augmented reality has been around for some time, but with the introduction of smart phones with Cameras, GPS, built in compasses and acceleromters, it seems that AR is finally ready to hit the big time and find its way into the every day life of the mobile phone user. For me there seems to be two distinct types of AR. The first is AR that uses fiducial markers, motion tracking and computer vision. These applications take a fair amount of processing power and are not really suited to mobile phones. An example of this type of AR can be seen here. The second is the Location Based AR. This seems to be driving the new interest in AR and there are a number of new Applications emerging for both Android devices and the iPhone. These types of AR applications don't need to use motion tracking or complicated computer vision systems. These applications use GPS and the built in compass of mobile devices to locate the distance and direction of POI (Points Of Interest). These points of interested are then displayed over the live camera view giving general information on the POI plus indications of its distance and direction. POIs can be anything, from twitter users, houses for sale, to interesting historical buildings. One of the first AR applications for Android devices that i became aware of was Enkin, but since then Wikitude and Layar seem to be the two main front running Location based AR applications available for Android. Wikitude gives the user information on general points of interest around their present location, such as interesting historical buildings, while the examples on Layar show services giving details of houses for sales and nearby twitter users. Both websites seem to be offering APIs to allow third party developers to build their own versions of AR applicaitons. In this post we are going to look at how to create a 3D flip animation, with a FrameLayout. In the first few posts I've written on Android and animations we have only looked at the predefined animations supplied in the android.view.animations package. In fact we've only used the translate animation, but as I've mentioned before there are also rotate, scale and alpha animations. In this tutorial i want to take a further look at animations and how we can created our own custom animations using the Android library. I've going to base the tutorial on some of the examples that can be found in the samples folders that are downloaded with the android SDK. These are some great examples, but unfortunately they seem to lack a little on documentation and explanation as to how, and what, the code is doing. Hopefully by the end of this tutorial things should be a little clearer. I've used some firefox image icons to animate, they are part of a very good and free icon set that can be found here. If you just want the images i've used they can be found here and here. Download these images and place them in the res/drawable folder of the Flip3d project. This class extends the Animation class and implements the applyTransformation method. Each Animation has a transformation object that Defines the transformation to be applied at a point in time of the Animation. When this animation is running the applyTransformation method will be called a number of times to allow us to calculate the transformation to be applied. Each time applyTransformation is called the interpolation value passed in will be increased slightly starting at 0 and ending up at 1. So our float 'degree' at line LINE NUMBER will increase slightly each time this method is called. Set a post translate so that the animated view is placed back in the centre of the screen. You can see that we also use the android.graphics.Camera class, don't get this confused with camera class in android.hardware which is used to control the Camera on the android device. The Camera class in the android.graphic package is very different, it is used to calculate 3d transformations that can then be applied to animations. This Camera class represents a virtual view as if we were looking at our Android views through a camera. As we move our virtual camera to the left , we have the effect of the android view moving to the right , and if we rotate our virtual camera, we have the effect of rotating our Android view. Here the Camera class is use to calculate a rotate transformation about the Y axis, it does this every time the applyTransformation method is called and so gives each incremental transformation that is needed to give a smooth rotation effect. Camera uses transformation matrices to store and calculate transforms. It's not really necessary to have an in depth knowledge of how transformation matricies work, but a good article on them can be found here. The article is based around flash, but the same principles apply. Now that we've got our rotation animation we need to come up with a plan of how to use it. We currently have two images but just rotating these isn't going to give us the effect we want. So what we need to do is hide the second image and display only the first. We will then rotate this image through 90 degree until it's edge on and we can no longer see it. At this point we will make the first image invisible and the second image visible, we will start the animation of the second image at a 90 degree angle and then roatate round until it is fully visible. To go back from the second to the first image we will just reverse the process. In the main activity class we have the usual onCreate method. In this method we get references to the two images that we are displaying. Here we also set the visibility of our second image to View.Gone. The final thing to be done in onCreate is to set up a click listener for our fist image (we don't need a click listener for the second image). In the click listener we have a boolean, isFirstImage, which tells us which image is currently visible, if it's true the first image is visible and if false the second image is visible. Depending on which image is visible, we call the applyRotation method with different start and end values, since we rotate the first image in a different direction to the second image. SwapViews does exactly what its name suggests and swaps the images, setting one image to invisible and the other to visible depending on which image was already visable, but it also does one last important thing, and that is to create and apply the last half of the animation. You should now have a working flip animation. This technique can also be applied to ViewGroups , so it could be used as a way to transition between different views. There are a few more things that we can do to this animation to improve it such as adding a depth effect, but I'll leave that to another post. Like I mentioned earlier, this example is based on the samples that are in the downloadable SDK files, so have a look at these samples as well.